Congratulations on your engagement!! One thing I have realized is that if you can get excited about your wedding venue, planning the wedding can be such a fun experience. If you haven’t already picked a venue, I would suggest Castle Hill Inn. It is one of my favorite local venues. With its close proximity to the beach, the venue’s historic features, and the gorgeous lawn, there are so many great photo opportunities at Castle Hill Inn. This is a 40-acre estate, so you have a lot of choices when it comes to picking your ceremony and reception location. This makes it the ideal venue for many couples. Depending on the option or options you choose for your ceremony and reception, the venue can accommodate up to 400 people, although some venue options are for smaller groups. This is a great option for couples who want a bit of the inside mixed with the outside. Their one-of-a-kind Sperry tent is beautifully lit up for an evening celebration with gorgeous chandeliers or other lighting of your choice. The chalet terrace has plenty of room for a great sit down reception as well as a great dance floor. One thing couples, as well as their guests, love about the Chalet Terrace is that there are breathtaking panoramic views of the Atlantic Ocean and Narragansett Bay. The Chalet itself is a great indoor option for a small, intimate ceremony. This is the option where you can enjoy a bit of the venue’s historic charm mixed with great views of the venue’s grounds. If you have ever dreamed of getting married just off the beach, this is a great place to exchange your wedding vows. 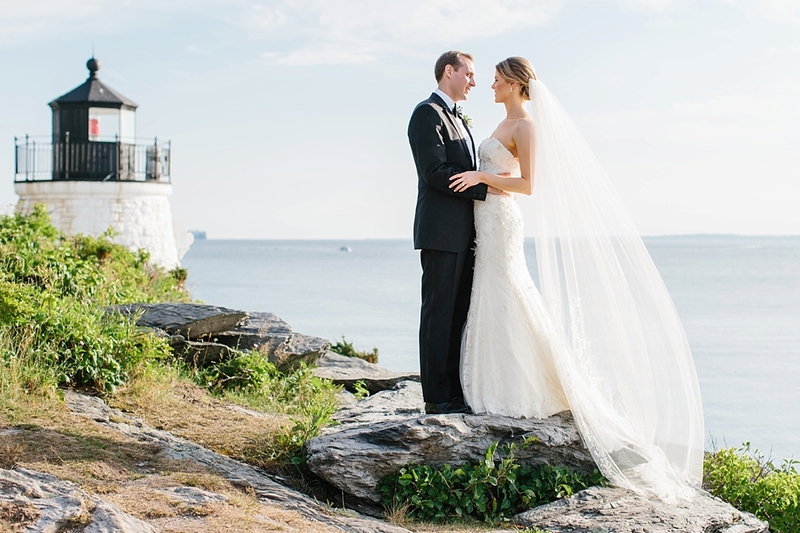 Because this option does not allow for a huge wedding party, you may instead want to have your first look photos by the lighthouse with the waves crashing in the background. It is also a great place for photos later in the evening either as a couple or with your bridal party. Sunset photos with the lighthouse and the gorgeous waves as your background are stunning. This is a great option both for the ceremony and the reception. Imagine walking down the aisle toward the ocean. As you exchange your vows, your photos will capture your loving smiles with the beautiful ocean, perhaps with a few sailboats, in the background. A lawn reception is great for larger wedding parties. Your guests can spread out a little and really enjoy the venue’s beautiful grounds. Plus, you can play fun games on the lawn with your guests, including crochet and bocce ball. Like the lighthouse, the lawn is a wonderful place for sunset photos with the ocean as your backdrop. Of course, the lawn and lighthouse are great places for wedding photos, but there are so many other great outdoor photo opportunities at this venue. The gorgeous wooded pathways and gardens provide wonderful natural backdrops for wedding photographs. I would definitely suggest taking a stroll down to Grace Kelly Beach, where Grace Kelly herself enjoyed the beach’s secluded beauty while she was filming High Society. This beach and Castle Hill Beach are wonderful settings for romantic wedding photos with your new spouse or for playful photos with your family and friends. In 2008, Castle Hill Inn became the first Rhode Island member of the Relais & Châteaux, an international group of hotels recognized for their great accommodations combined with wonderful food. That means you can count on having top-quality food for your reception or cocktail hour. When booking a Castle Hill Inn wedding, you pick the menu that fits your needs. Many of their dishes include locally harvested seafood as well as other delicious fresh ingredients. Not only does the food taste good, but it is also beautifully presented. While the overnight accommodations are not the top reason to get married at this venue, they are an added bonus. The wedding packages include a two-bedroom suite for the bride and groom. After a great wedding celebration, some of your guests may also want to spend the night at the Castle Hill Inn where you can enjoy an assortment of great amenities, including luxurious bathrobes and slippers as well as a full gourmet breakfast the next morning. While it might be a bit of a cliche, a picture really is worth so much more than words can describe when it comes to the beauty of this venue. How about around 40 photos? If you haven’t already, I encourage you to take a look at these photos that I took at a beautiful Castle Hill Inn wedding.